MUMBAI: At least 30 passengers on a Jet Airways Mumbai-Jaipur flight suffered ear and nose bleeding due to low cabin pressure, creating an alarming situation during the aircraft's ascent here on Thursday, officials said. 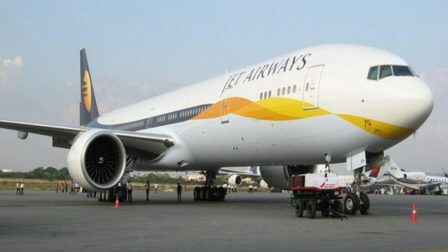 The flight 9W-697 with 166 passengers and five crew, was forced to return to Mumbai shortly after take-off at around 6 a.m. from the Chhatrapati Shivaji Maharaj International Airport (CSMIA), said a Jet Airways spokesperson. Several passengers complained of severe headache and stinging pain in the ears. After the flight returned, they were immediately deboarded and rushed to the terminal building and administered first-aid by a team of doctors. Airport sources said that the incident may have happened after the crew reportedly missed activating what is called a 'bleed switch' before take-off, leading to the disturbance in the cabin pressure with oxygen masks getting deployed. Jet Airways said it has derostered the concerned cockpit crew who will remain off scheduled duties pending an investigation. The Ministry of Civil Aviation said it has taken "cognisance" of the incident and ordered the Directorate-General of Civil Aviation (DGCA) to investigate and file its report on the matter immediately. Meanwhile, furious passengers onboard the flight vented their ire via social media accusing the airline of completely ignoring their plight during the incident. "Panic situation due to technical fault in the flight. Flight returns back to Mumbai after 45 minutes. All passengers are safe including me," tweeted a passenger. He claimed that after take-off the air-conditioning malfunctioned after which the air pressure system malfunctioned and oxygen masks dropped down. Other passengers complained that they were forced to sit in the aircraft for long, no breakfast was served and there was no information from the airline. "We emergency landed. Now what? Ground staff has no answers. Kya Karen," rued another passenger. One passenger said the flight was on the runway since 20 minutes without any ventilation and total suffocation, and "don't know if will make it". Many more people onboard also posted short video clips.